With her husband Bernard two years in the grave, seventy-nine-year-old Harriet Chance sets sail on an ill-conceived Alaskan cruise only to discover through a series of revelations that she's been living the past sixty years of her life under entirely false pretenses. There, amid the buffets and lounge singers, between the imagined appearance of her late husband and the very real arrival of her estranged daughter midway through the cruise, Harriet is forced to take a long look back, confronting the truth about pivotal events that changed the course of her life. Jonathan Evison—bestselling author of West of Here, The Revised Fundamentals of Caregiving, and All About Lulu—has crafted a bighearted novel with a supremely endearing heroine at its center. Through Harriet, he paints a bittersweet portrait of a postmodern everywoman with great warmth, humanity, and humor. Part dysfunctional love story, part poignant exploration of the mother/daughter relationship, nothing is what it seems in this tale of acceptance, reexamination, forgiveness, and, ultimately, healing. 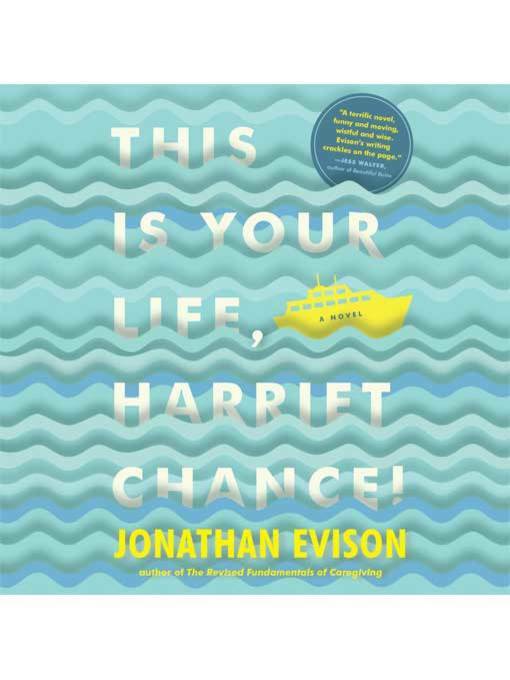 It is sure to appeal to admirers of Evison's previous work, as well as fans of such writers as Meg Wolitzer, Junot Diaz, and Karen Joy.